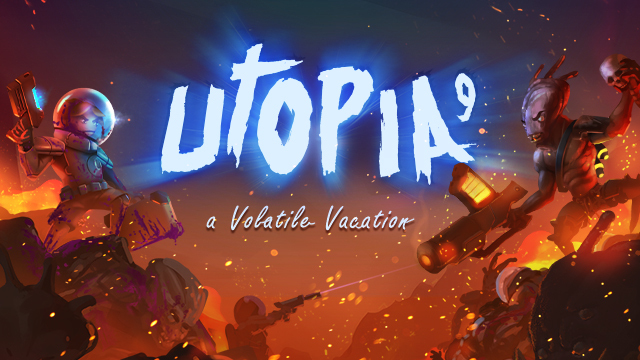 I wanna talk a little bit about the feedback we designed for Utopia 9 - A Volatile Vacation because frankly, I think we did a pretty good job at it. Hopefully you guys can pick up a few tricks for your own games along the way. Utopia 9 started production in late 2015 and 1½ years later we released on Steam. The core development team consists of 2 people: Rune programming and me (Mathias) doing the art. When you are a small team like us you can cut away a lot of the bureaucracy one might experience in larger groups of developers. This way we had the freedom to polish certain aspects of the game even if it broke the scope. Being a small team also meant we had limited resources and skills. One of my main skills, as an artist, is interaction, so logically we have pumped a good deal of time and effort into making Utopia 9 feedback. What I want to focus on in these articles is how we designed the combat feedback. Specifically the attack-, taking damage-, give damage-, and death-feedback. The first article will be about the attack feedback. I won't go too much into the aesthetic choices, but I will mention Naruto Shippuden: Ninja Storm as one of my main inspirational resources. One of the few games where the phrase “Less is More” isn’t fitting. Since Utopia 9 is all about action, the combat feedback is immensely important. The action you do the most in the game is shoot. So naturally the first place to start the design of the combat feedback was with the attack. The raygun is a very iconic weapon from our game, so let's take an indepth look at how the attack with this weapon was built. Unity 3D has a wonderful particle system that can give you a lot of cool effects with very little effort. So naturally the first step was to build the attack feedback around it. I utilized spritesheet animations as the fundament for most of my effects and added a regular billboard sprites on top of that for greater power. The combination of the two elements gave the game a very toony look. The beam is a texture that is stretched from the muzzle of the weapon and out towards the target over a short period of time. When it impacts with an obstacle or enemy, or when it reaches it’s maximum distance, the texture’s tail collapses into the front of the texture. We typically use between 4 and 12 frames in our spritesheets depending on the duration of the attack. Because the raygun’s beam is so slow to emerge from the barrel the spritesheet animation have a higher duration and therefore a relatively high frame count (8). On many of our bullet weapons the spritesheet is only 4 frames. To make sure that each shot doesn’t look the same, and not have to create a handful of unique spritesheets for each muzzle flash, we needed to add another particle effect. Rotating the flash billboard wouldn’t work since it has an off colored lens flare effect burned into it. What we did instead was to add some extra lines that spawn in random directions. This made the each shot look just slightly different from the last. I have done this with all my effects. The recurring spritesheet and a randomized other effect combined gives the muzzle flash a distinct look, while still feeling new each time. We wanted all weapons in the game to have a sense of weight to them. For melee weapons we added a forward pull and all other weapons were given recoil. The stronger the weapon the greater the recoil. For example, the Raygun is powerful so the recoil is pretty high whereas the pistol is very weak, so it has a very low recoil. For our weapons with a high rate of fire (UZI) we have tweaked the system so the recoil from each shot doesn’t stack. In other words, our automatic weapons cannot be used as jet motors. The magnitude of the pull applied by melee weapons is controlled with a curve so we can sync it with the attack animation. Heavy weapons have a huge waves, smaller weapons have a small bumps. Camera shake is a powerful effect that provides information to the player no matter where they focus on the screen. We quickly decided to have camera shake on all weapons as they fire, explosions and on melee attack hits. The more powerful the weapon, the greater and longer the shake. Other than simply providing gameplay feedback, it makes the weapons feel great and allows the player to feel the strength of the weapon through the strength of the effect. On the downside camera shake can cause motion sickness when used extensively so we use it to a lesser extend for fully automatic weapons. All these things combined makes the attack feedback pretty cool. There are of course more things that would have been great to add as well. I for once would have loved to have a full time animator on the game. This attack feedback could really benefit from a cool pose as the recoil pushes you backwards. But we have found that the players are mostly looking at their targets, the mutants, and not the player. So when you play you hardly notice the lacking animation. Which leads me to the next topic of our feedback: Taking Damage. I will delve further into that in the next part of our feedback article.